One of the things I miss most about living in London is easy access to the theatre. When I first moved to the city, I used to go to the theatre incredibly regularly – often a couple of times a week, taking advantage of standby tickets at discounted rates. I lived a 15-minute tube ride from the West End and there’s something about that moment when the house lights dim and the stage lights come up that never, ever fails to put me on the edge of my seat. This weekend, I took EldestGirl to her first “proper” West End show. 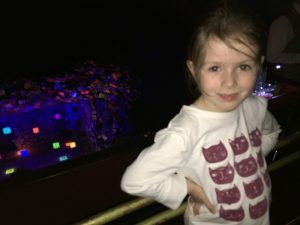 We have seen kiddy things together before – The Gruffalo in the West End when she was nearly three, a children’s ballet at our local theatre, and a few pantos and so on. But this was a proper investment in a proper full-length show – it was to be her birthday present. 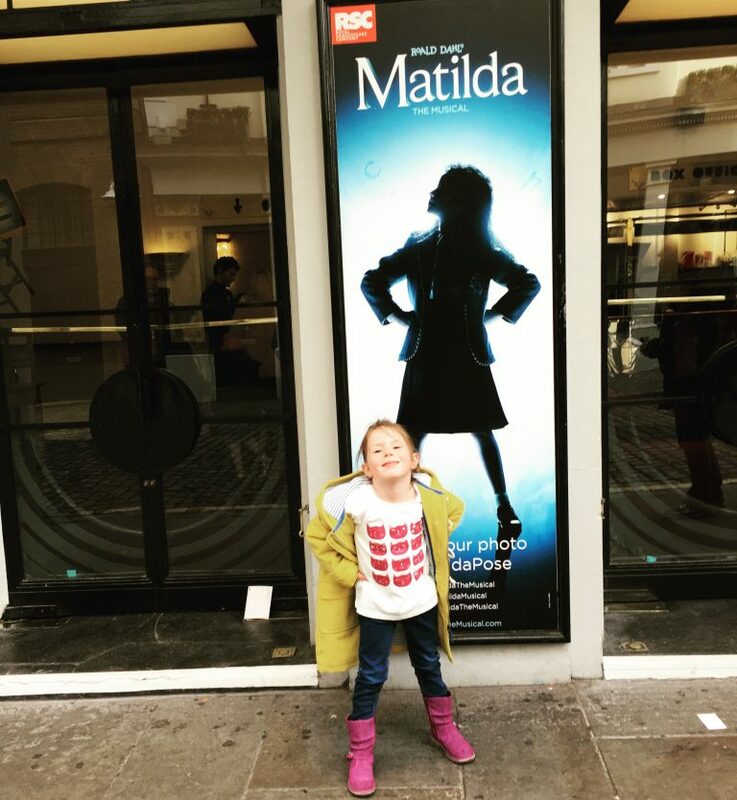 Where better to take a book-loving five year-old than to see Tim Minchin’s amazing Matilda? 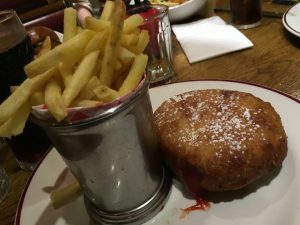 Meeting up with my friend Erica, and her daughter who’s a year or so older than EldestGirl, we went to Maxwell’s for lunch, where EldestGirl simultaneously proclaimed herself far too full to finish her main course, and yet absolutely starving for pudding. A burger. In a doughnut. Life is sweet. And burgery. To be fair to her, I sort of felt the same, having ordered a burger literally inside a doughnut (the icing sugar on top was not an entirely welcome surprise), although I tried to be a grown up and didn’t order pudding. Erica’s freakshake though was an absolute work of art. 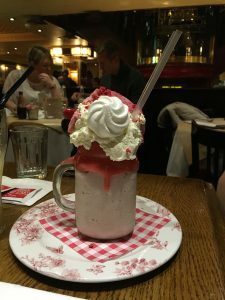 The girls were both spoiled by the staff with balloons on the table, and even candles in their puddings to celebrate their birthdays which were actually well over a month ago. Then, across Long Acre, down Neal Street (with fewer shoe shops now than I remember), and over to Seven Dials to see the show. More than watching the talent on the stage, it was amazing to watch EldestGirl’s face: she is of that age where she can’t yet properly distinguish between something real and a special effect. So I think she thought poor old Amanda Thripp really did get thrown into the audience by her pigtails, and that Bruce Bogtrotter really did eat that whole cake. 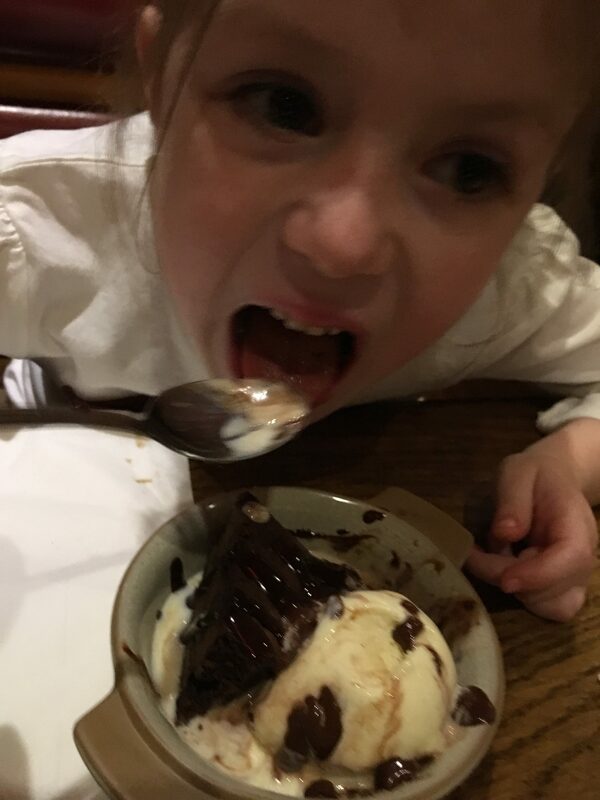 EldestGirl had done a decent impression of Bruce Bogtrotter, earlier in the day at Maxwell’s. 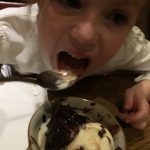 EldestGirl now wants to be Matilda. I don’t mean she wants to play at being Matilda or to read lots of books like Matilda. She wants to be the girl that stands on the stage. Seeing as she seems to have inherited her mother’s physicality (inherently clumsy) and her singing is – ahem – typical of a five year-old girl, I’m not 100% sure this dream is going to come true. In the meantime, she has asked me to enrol her in some singing and acting classes. The weekend just got a lot more expensive. Grandad can recommend some good Extras agencies haha! EldestGirl has no interest in being an extra, believe me. Super trouper or nothing for this girl. Tim Minchin’s amazing. Have you seen the ‘Storm’ thing that’s on Youtube? I love that.